This former Butte des Morts school house is located on what is now County Trunk S and Spiegelberg Road. 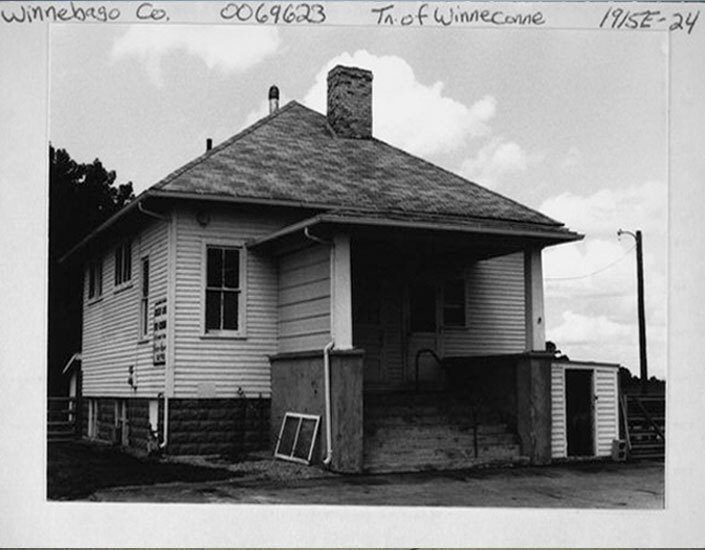 Photo courtesy of Wisconsin Historical Society. It was built in 1916 on property previously owned by Augustin Grignon, that he later deeded to the Winneconne School system in 1853. After this school house closed in 1963, it was used as a community center for Butte des Morts. No longer able to afford to keep up the building, the Butte des Morts Citizen Association eventually sold it to be used as a private residence, as it remains today. The original school on this property closed in 1916 and was sold to Frank Scovel. That old structure was then moved to the Skovel farm (formerly the Hull House) in Butte des Morts where it is now used as a garage.